This photo of the spiral galaxy NGC 891 was the "first light" image made by the 32-inch reflecting telescope at the University of Utah's new, $860,000 Willard L. Eccles Observatory, located in southern Utah about 250 miles from the university's Salt Lake City campus. The observatory will be used for research, student education and even public star parties once it is equipped for remote-control operations. It'snot every day a large new telescope opens for business, and a new observatoryrun by the University of Utah has just taken its first picture of the cosmos. 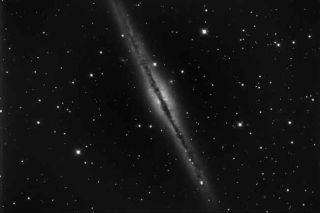 The"first light" image, as it's called, is an edge-on view of the spiralgalaxy NGC 891. TheWillard L. Eccles Observatory's 32-inch reflecting telescope took its firstpictures the night of Oct. 15. The first photo was released last week and theinitial observations will be celebrated at a Nov. 11 symposium and reception onthe Salt Lake City campus. The$860,000 observatory is sits 9,600 feet atop Frisco Peak, near Milford, Utah.An additional grant is being sought to allow remote observations to be done atthe observatory, which is about 250 miles from campus. Sometweaking is planned for the next few months, and scientific observations shouldbegin in earnest next spring, said Wayne Springer, an associate professor ofphysics and astronomy who leads the project. "Wewill certainly utilize the facility for education of students and for publicoutreach opportunities," including star parties in Salt Lake City thatwill use the telescope by remote control," Springer said.